Are you looking a place to get your Tonga passport photo or visa photo in London? Then come to Reload Internet for a fast, efficient, reliable and affordable service. 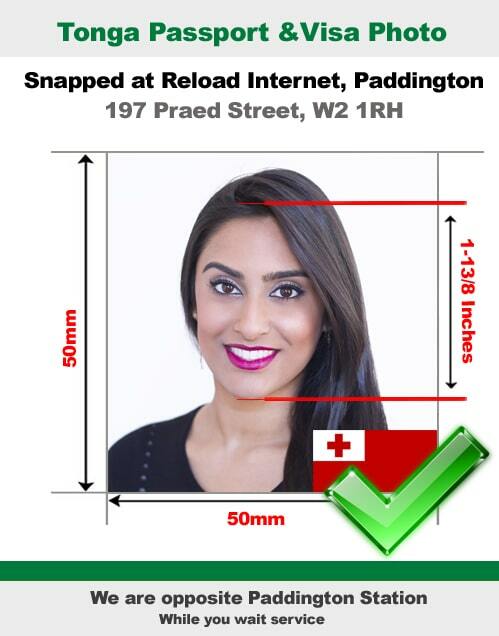 You don’t require any prior appointment to have your Tonga passport photo or visa photo produced by us, just stop by our store in Paddington and we can have your photographs ready for you within 10 minutes! Our studio is open every day of the week, and our location being extremely close to both Paddington tube station and train station allows for easy accessibility for you to have your photo taken at a time that suits you. We have a team of experienced staff that will capture your Tonga passport photo or visa photo with the correct lighting and background, and will then cross-check the photograph with the Tonga Embassy’s official guidelines on passport and visa photos to ensure that it will pass first time. After our staff are satisfied that your photograph will pass, we will print it using the latest embassy approved digital printers and cut them to the exact size required, leaving you with a set of high-quality photographs that meet all of the necessary criteria for an affordable price! The video below shows how quickly we can produce your Tonga passport and visa photos! If your Tonga passport photo or visa photo fails to meet the specifications listed below, your application will probably be rejected because of a photo error. Come to Reload Internet to ensure that this does not happen to you! Any kind of headgear like hats etc. that covers your hair or hairline is not allowed unless for religious or medical reasons. Even so your facial features must be clearly visible. The photos are to be taken with a closed mouth with a neutral facial expression. There cannot be smiles, grins, frowns or teeth showing. Your eyes must be normally open with no squinting or raised eyebrows allowed as well as any other contrived expressions. The applicant’s head must be square to the camera and not at an angle. Even a slight tilt, turn or rotation of the face will not be acceptable. Equal amount of your ears and cheeks on both the sides is to be visible. The person’s eyes and face should face the camera straight. The person photographed should look directly into the camera with eyes clearly open and visible. The eyes should not be covered by any spectacle frames or hair. The photograph should be taken with the camera lens at eye level. The photographs are to be printed on high quality paper with a minimum 600 dpi resolution, especially if taken with digital cameras. The photograph should have neutral color with natural skin tones. No impurities or creases are allowed in the photo. Any kind of editing done on the photos for removal of spots or lines etc. is not allowed. Only color photos are acceptable. Your name should be signed on the back of the photographs. Our specifications are taken from the Embassy of Tonga’s official guidelines on passport and visa photographs.